This addon adds 24 female, and 14 male hairstyles, imported of plug-ins for \"Oblivion\"
---> Sorry, I don't speak english. This is machine translation. I don't answer on frequently recurring issues what arising by wrong installation, or conflicts. Please read the forum and readme. UPDATE: v 2.2 - Fixed a bug with Nova. This Version don't contains new models of hair! If you have already downloaded version 2.1, just download the patch for Nova, you don't need download full version 2.2! Also added new hairstyle for some male NPC, citizens, raiders, etc. (optional). 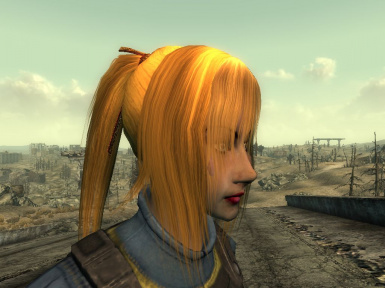 This addon adds 24 new female, and 14 male hair style, imported of plugins for "Oblivion." Folders "Eng" and "Rus" contains english and russian master file, and plugin file, who added haircuts for some NPC's (like "SPARTAN VIs Pretty Girls"), raiders, and some other NPC. Don't use hair_add_npc.esp without Hairpack.esm, this will not work. -->> WARNING! This addon not compatible with any other plugins, who change records RACE and EYES !!! Unzip folders "textures" and "meshes" to a your Data folder. Unpack HairPack.esm and hair_add_npc.esp(optional) to your Data folder (for russian version use files from RUS folder). 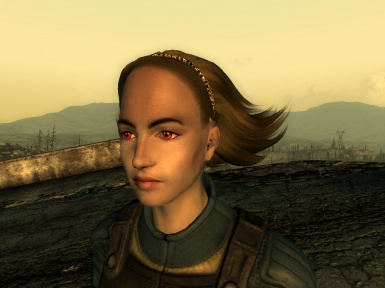 If you want new hairstyle for some NPC, use the plugin "hair_add_npc.esp". This file must be used only with HairPack.esm!!! Folder HairPackCompSaramHM contains master file and plugin file, who compatible with "Saram Hair Mod". 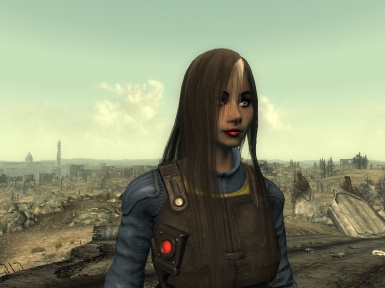 You need download the full version of "Saram Hair Mod" therehttp://www.fallout3nexus.com/downloads/file.php?id=5462 and unpack "textures" and "meshes" folders, into yuor "Data" folder. * If you use russian.esp, or other plugin with translation, remember - plugins for localisation overwrite field RACE, EYES and NPC_. 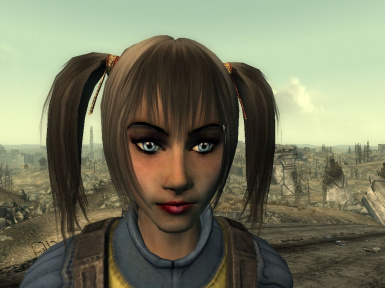 I retained compatibility with "Josef Grey's' Kozaburo 'Hair Style for Fallout 3" (http://www.fallout3nexus.com/downloads/file.php?id=749). 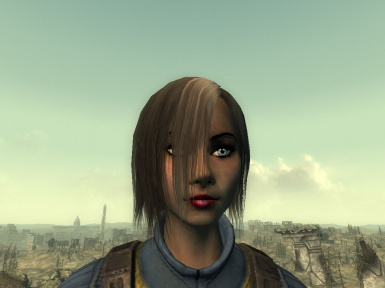 Uncheck "Josef Greys Kozaburo Hair Style for Fallout 3.esp" in your FalloutLauncher, but do not remove the Kozaburo textures and hair mesh. This archive has no containt models and textures to Kozaburo hairstyle! The master file contains records HAIR, EYES, and RACE. 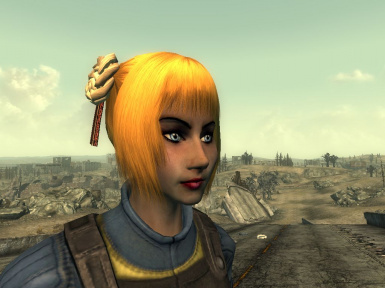 All races (Ghoul, Child, Old, Raiders) added links to hair and eyes from my addon. The plugin file (hair_add_npc.esp) contains changes for NPC. In the Russian version hair_add_npc also includes a field RACE, so-as "russian.esp" rewrite RACE record of master file. 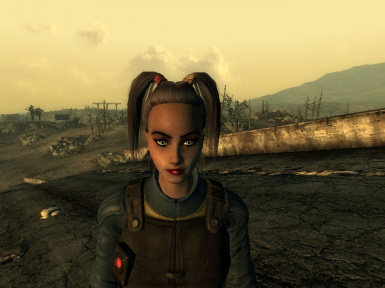 Open in GECK fallout3.esm + HairPack.esm + your addon, and change hairstyle for NPC. Remove folder "eyes" in Data\textures\characters. This is not my model and texture. I just converted and gathered them in this addon. Thank to Ren, idkrrr (sorry, that does not include your name in the list of previous versions), Kozaburo (http://digitalbabes2.com) and other master, for modeles and textures. Thank to Zacam1369, for all english names of haircuts and fixes. You can use this addon as you like, without an agreement with me.